To Cite: Mufeed A , Hafiz A , Noufal A . 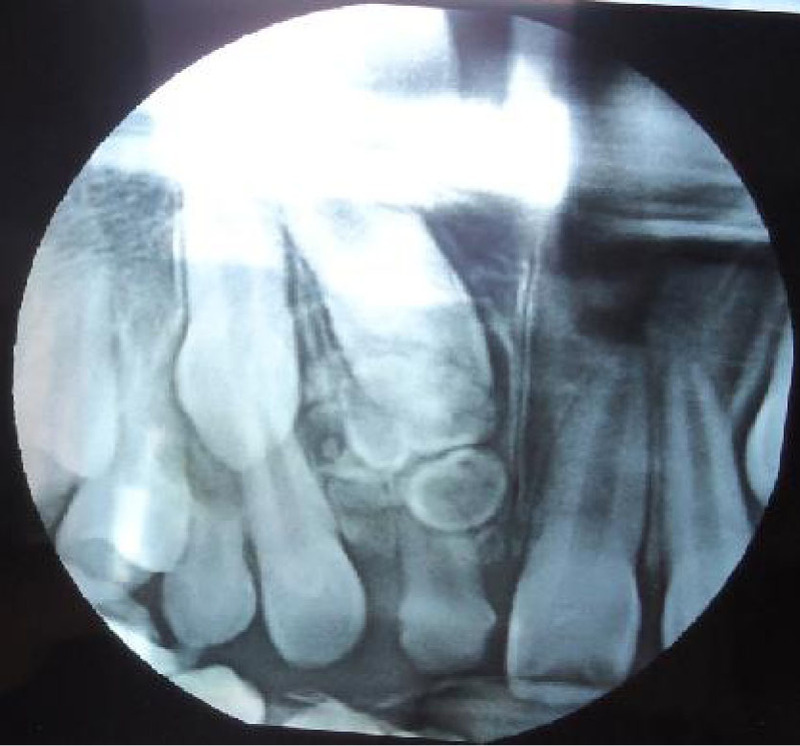 Complex Odontomas Hampering Eruption of Permanent Tooth, Iran J Pediatr. 2014 ; 24(4):455-456. Eruption of deciduous teeth, their exfoliation followed by eruption of permanent dentition is an orderly sequential and age specific event. Significant deviations from accepted norms of eruption time are often observed. Most parents are anxious about delayed tooth eruption, as it is considered to be an important milestone during child’s development. Delayed tooth eruption might be the primary or sole manifestation of local or systemic pathology. The systemic conditions like malnut-rition, rickets, endocrinopathies, chemotherapy, cerebral palsy and low birth weight can lead to delayed tooth eruption. Local factors delaying eruption may include presence of mucosal barriers, supernumerary teeth, odontogenic and non odontogenic tumors, local infections, injury and ankylosis of deciduous teeth. 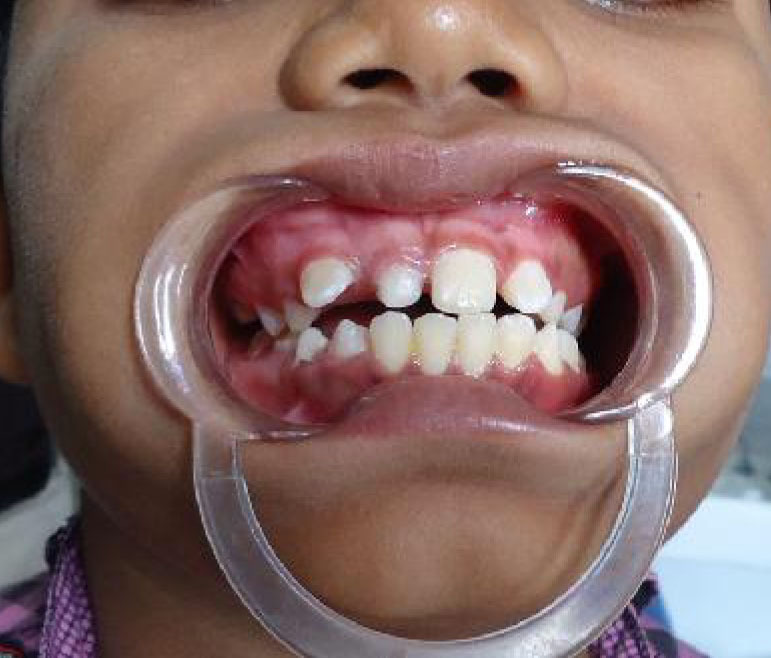 A 12 year old boy referred with a complaint of missing right central incisor tooth. Examination of his upper jaw revealed that the central incisor tooth was unerupted and the deciduous counterpart was retained with mesial drifting of the lateral tooth creating an anesthetic appearance (Fig. 1). Radiographic examination showed presence of multiple circular and irregularly shaped radiopaque structures in anterior maxilla, overlapping the crown of unerupted permanent tooth (Fig. 2). Based on the diagnosis of complex odontoma, the area was surgically explored and the tumorous masses were removed. The gross examination and histological evaluation confirmed the diagnosis of complex odontoma. Patient is presently under observation as parents opted to wait and orthodontic extrusion is planned if no physiologic eruption took place in 6 months post operative period. Odontomas are mixed odontogenic tumors, since they are composed of both epithelial and mesenchymal tissues. However, biologically regarded as hamartomas rather than neoplasms. Most of the cases of odontomas are often undetected because they are clinically asymptomatic and nonaggressive. They are usually identified on routine radiographic examinations or during evaluation of delayed tooth eruption as in this case.